In a Nutshell: Students don’t typically have the credit history to earn favorable interest rates on the loans required to boost their future prospects. However, by enlisting the help of a willing co-signer, borrowers with limited credit can gain access to improved rates and increased savings. 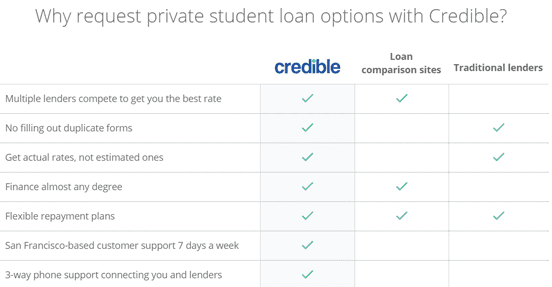 San Francisco-based refinance portal, Credible, links more than a dozen lenders with consumers looking to refinance their student loan debt. A refinance can lower interest rates and improve other terms to save thousands of dollars over the life of the loan. A case study showed that Credible was able to save a large group of its customers an average of nearly $19,000 in interest payments through refinancing. If you’re like me, and 44 million other Americans, you have student loan payments as a permanent fixture in your monthly budget. In all, Americans owe more than $1.4 trillion in student loans, which is nearly $620 billion more than the country collectively owes in credit card debt. While many lenders don’t see student debt as bad debt, having a high monthly payment can wreck your debt-to-income ratio and drag your creditworthiness down to new depths. If you have limited credit from your student debt, or your credit history is still too new to have a higher score, you may think your only option is to continue paying at your current rates and patiently wait for the day when you’ll be free of the burden. In some cases, particularly among those who pursue post-graduate degrees, this can take decades. Refinancing your loans — meaning you roll your old loan (or multiple loans) into a new one with improved terms — can be an attractive option for lowering your monthly expenses. However, finding a lender willing to refinance a loan held by a borrower with a lower credit profile is difficult. Each time you formally apply for a loan or refi through an institution, a hard inquiry is made on your credit score. Too many inquiries can cause your credit score to suffer, as it looks like you’re applying for multiple loans and are strapped for cash. One way to improve your chances of a favorable refinance is by enlisting the help of a co-signer. This can be a parent, spouse, or any adult willing to back up your promise to repay the loans if you cannot. San Francisco-based refinance broker Credible is one of the web’s leaders in connecting borrowers with lenders and offers a co-sign option that helps borrowers qualify for loans. Since its founding in 2012, more than 132,000 student loans have been refinanced through Credible’s lending portal. Credible’s two-minute, pre-qualification application counts as a soft credit pull, meaning it won’t hurt your credit score. You’ll be presented with several potential offers from lenders based on your credit score and other information you provide. 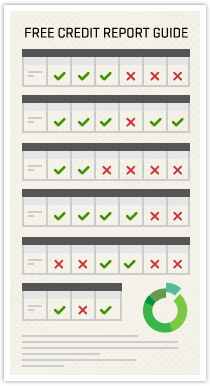 Credible does not actually advance loans, but partners with multiple lenders who do. Users can peruse the results and choose to formally apply for any of the offers by submitting a more in-depth application, which will then count as a hard credit inquiry. To refinance loans on your own, Credible has a minimum credit score requirementof 650, as well as a debt minimum of $5,000. If an applicant does not meet those qualifications, no offers are extended. But, this doesn’t mean a refinance is impossible. This is where co-signers come in. So what is the benefit of adding a co-signer to your refinance application, other than just getting approved? Credible allows any adult with a verifiable annual income greater than $24,000 to act as a co-signer. This person is backing the applicant’s promise to repay. If the loan goes into default, the co-signer becomes responsible for the loan and also bears the brunt of any credit damage that occurs with late payments. The advantages to having a co-signer are many. Just over 50% of undergraduates shopping for loans with a co-signer on the Credible platform received personalized rate quotes, compared to 20% of undergraduates who did not have a co-signer. Interest rates for undergrads with a co-signer averaged 5.37%, compared to a 7.46% rate for students without a co-signer. That difference, in itself, can save a borrower thousands of dollars in interest over the life of a loan. The typical student loan refinance includes fixed rates between 3.5% and 9% and a variable range between 2.13% and 9.25%. Eligible balances fall between $5,000 and $500,000. Another benefit of refinancing with a co-signer is that a new loan would allow you to change the terms of your current debt. If you make enough money to increase your monthly payment, you can lower your rate and the length of your loan (also called the term) and pay off your debt sooner with greater savings in the long term. Co-signers must fill out the same form a borrower completes, with only a soft pull occurring on each credit report. According to a study, borrowers using the Credible marketplace from April 15, 2015 to Sept. 21, 2016 saved an average of nearly $19,000. This figure is based on borrowers who refinanced loan balances averaging $56,202 into loans with shorter repayment terms. If you’re not in the market to increase your payments, refinancing through a co-signer could still lower your interest rate. You could extend the term of your loan (adding years to your loan) and lower your monthly payment significantly. If you keep the term the same, a lower rate will still save money on your monthly debt load. To help with peace of mind, many lenders allow co-signers to be removed from a loan after 24 to 36 consecutive, on-time payments have been made. Before you sign a loan, however, you should always check with the lender about its rules regarding co-signer removal. In recent years, as student loan debt has ballooned in America, a multitude of options have emerged to help pay for your higher education. Among them are private lenders and organizations that offer lower rates and better terms than those available for federal student loans. Private loans will still require a co-signer if your credit profile doesn’t qualify, but through Credible’s search options, the funding possibilities are numerous. During the 2014-2015 academic year, the six largest private lenders made $7.12 billion in student loans, an 8% increase from the year before and a 36% increase from 2010-11. Private loans through Credible feature interest rates that range from 3.74% to 12.14% fixed and 2.06% to 9.95% variable. Federal student loans also feature very good rates, but are limited to $31,000 for students working toward an undergraduate degree. After that limit is reached, the only federal option is through a PLUS loan, at a much higher interest rate (sometimes reaching as much as 7%). Private loans do not have caps (the minimum through Credible is still $5,000 to refinance, but there are some lenders with no limit on maximums). While many private loans offer rates and terms that can save you money over the long haul, they are not eligible for many of the benefits that federal loans include, like income-driven repayment plans or certain types of deferment or loan forgiveness. It’s important to research lenders before agreeing to a refinance with them. Refinancing debt is not a new trend. It’s commonplace with mortgages, auto loans, and loan consolidation. But, in recent years, the push by outside companies to get a piece of the trillion-dollar student loan industry has prompted a flood of competition in the market. That’s a good thing if you’re looking to refinance and improve your student loan terms, as each new competitor forces the others to adjust their terms to a new norm. Your credit score doesn’t have to hinder your ability to get more favorable rates on your debt. By enlisting the help of a willing co-signer, you can use Credible’s search tool to find potential offers from partner lenders without wreaking havoc on your credit score by making multiple inquiries. These tools empower consumers, who can now shop for the lowest possible rates instead of settling for whatever is offered from a local bank or lending institution. It’s important to remember that a co-signer is just as responsible for your loan as you are. The trust they place on you should be returned with on-time payments that not only improve their credit rating, but yours as well. If you’re currently not qualifying for a favorable refi, Credible stresses that you should not give up hope.